If you want to purchase a jewel that has already been sold in my shop, do not hesitate tocontactme to check if I can do another item in the same style as well as its price. 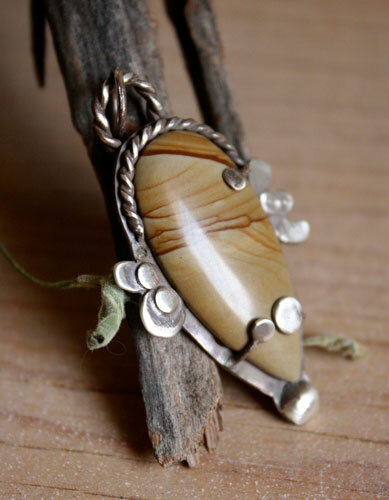 This pendant is designed around a picture jasper teardrop. I set it with claws to maximize visibility of the stone. 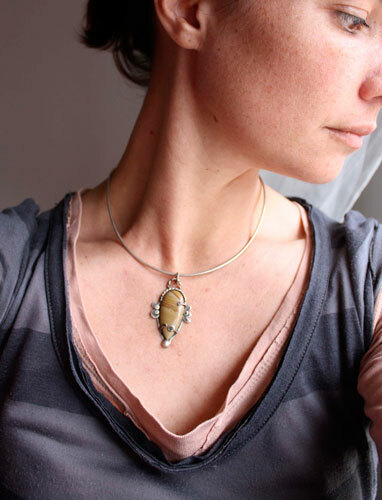 The upper part and the fastener of pendant are made with a twisted wire giving consistency and elegance to this jewel. It evokes movement and the whirlwind. 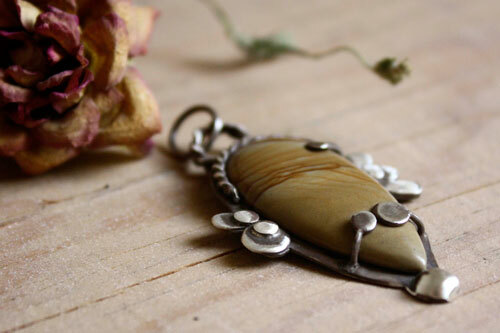 It is decorated with a vegetal motif, with leaves on each side of the semi-precious stone. 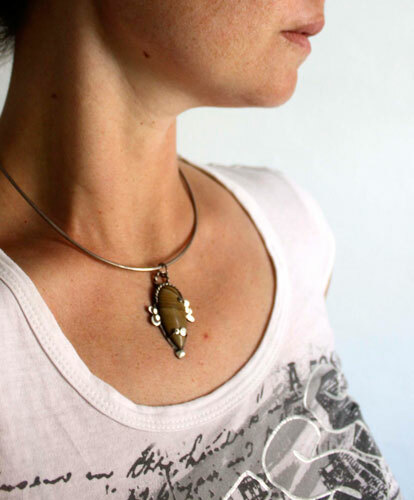 The tip of the stone ends with a hemisphere reminiscent claws. 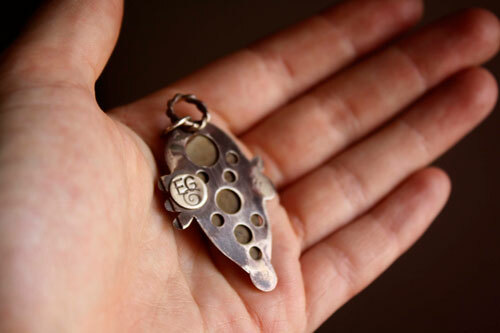 The back of the pendant is perforated with a series of circles, which let us see the back of this picture jasper. 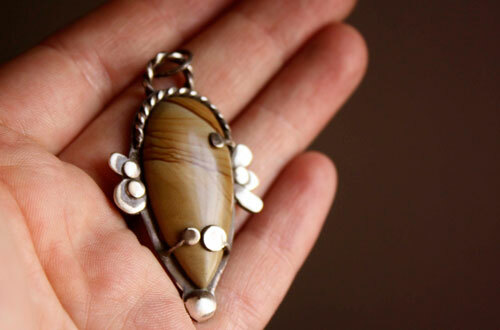 The peculiarity of this jasper is that they represent a random landscape. This stone shows variations of brown-cream lines. They bring to mind a sandstorm in the desert. This violent wind sweeps the sand and form strange patterns on the floor. Therefore, I set the stone with small claws forms of desert flowers. I called it Engelis, which means "angel" because on each side, little wings seem to fly. It may be that angel who, landing in the desert, causes this violent wind that sweeps the sand. 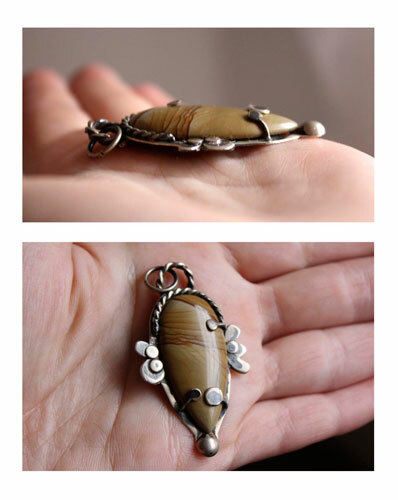 This pendant measures about 5.5 x 3 cm large. 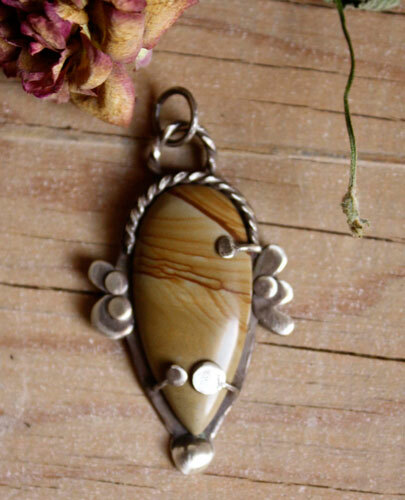 Tag: pendant, sterling silver, jasper, beige, brown, vegetable, floral, flower, romantic, ecological, oxidized, gift, anniversary, jewelry, unique, drop, desert, wind, swirl, movement, storm, storm, sand, angel, wings, landscape, picture.